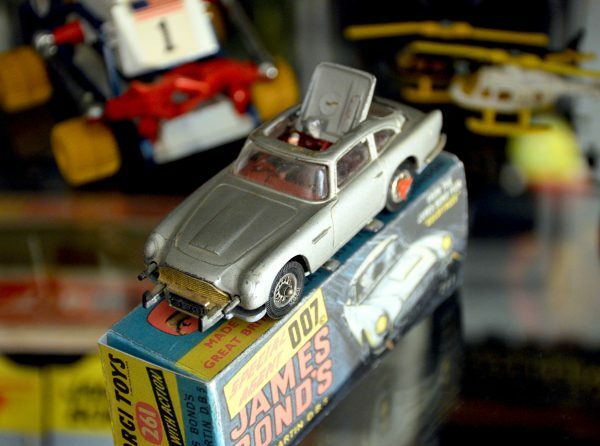 Guest writer Brendan Edwards delves into the history of Corgi’s best selling toy car. By the time Goldfinger was released at in 1965, the James Bond movies were already renowned for having beautiful women, exotic locations, and lots of action. In Goldfinger, the producers introduced a new element to the series, by giving Bond a sleek, powerful and very dangerous car. We are first introduced to the Aston Martin DB5 in the basement of Q Branch, where Major Boothroyd gives Bond a lecture on all of its modifications and weapons. “An ejector seat? You’ve got to be joking,” says Sean Connery as Bond with his thick Scottish accent. “I never joke about my work 007,” Desmond Llewelyn as Q coldly replies. 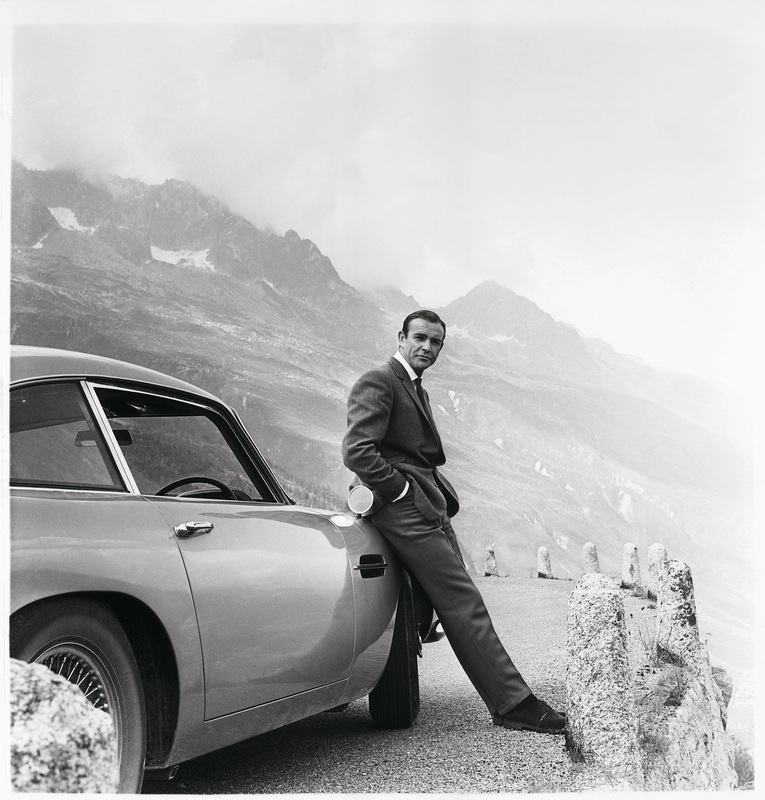 Although the Aston Martin DB5 only appeared on film less than thirteen minutes, 50 years later it has become one of the most recognizable cars from the James Bond franchise. Even more amazing given that the car was written off and destroyed halfway through filming Goldfinger when James Bond drove it into a wall which collapsed upon it. How did the Aston Martin DB5 become one of the franchises most identifiable characters? Perhaps Corgi Toys had something to do with this. Back in the 1960’s, Corgi Toys were branching out and specialising in producing many film and television tie-in models. They lucked out when they got the licence to produce the Aston Martin DB5 from the movie Goldfinger. Corgi produced a 1:46 replica of the Aston Martin DB5 which measured 4 inches long and came with a number of extra features. The car came with hidden machine guns at the front, which extended when you pressed a small button to the left side of the car. Pressing the twin-exhaust pipes raised a bulletproof shield from the boot. It’s most popular and endearing feature was the working ejector seat. Pushing a button on the side made the roof spring open to eject a mini-plastic bad guy from the passenger seat. Kids of all ages relished in sending this little figurine into space, and the car came with quite a powerful spring. Those figurines got some serious height. Sadly, the majority of plastic figurines were lost over time. Buried under the cushions of a couch, sitting at the bottom of a toy box or worse. Sucked up by the vacuum cleaner and ending up in the rubbish bin. It is rare to find an original 1965 Corgi car with its passenger intact, and in good shape. This was a dream toy for kids of all ages and sizes. It’s only issue was its colour. ‘Why was it painted gold’ instead of silver like in the movie? Apparently, Corgi’s marketing team didn’t like the proposed silver finish from the movie and decided to paint it gold to reflect the movie’s title instead. The model was released in time for the 1965 Christmas market and Corgi found it was unable to keep up with demand, and some toy shop shelves were reported to being cleared of this new must-have toy within minutes. Corgi sold over 3.9 million cars, which was their highest selling car and won the UK toy of the year award, so guess painting it gold instead of silver may have been the right choice. Corgi re-released this car in 1968, and did the right thing and made the paintwork silver (rather than the gold of the original model). They also upgraded the car to include revolving number plates and rear tyre slashers, and made it slightly larger in order to accommodate the extra features. As history goes, they re-re-released it and then re-re-re-released it, and re-released it. Bigger, smaller. Some with an ejector seat. Others without. The Aston Martin DB5 was even recreated by Lego in 2018. Twenty, thirty, forty, maybe even fifty different versions of the same car exist on the market today released by a number of different companies. This has gone on to become of the franchises most endearing and much loved pieces of movie memorabilia. When Corgi released their version of the Aston Martin DB5 in 1965 James Bond certainly wasn’t quite the cultural icon it is today. The biggest influence that Corgi had was to introduce a whole new audience to James Bond. 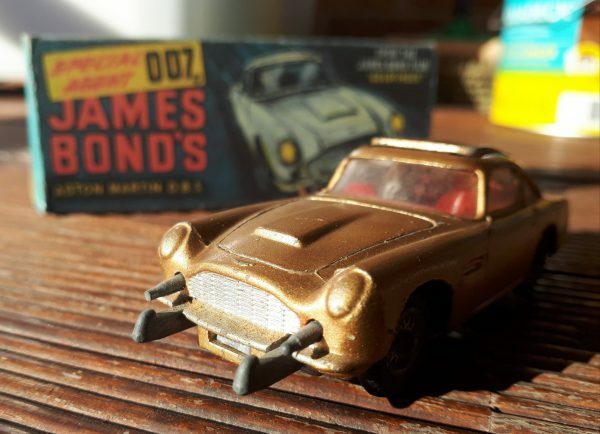 Children who at the time may never have heard of James Bond suddenly had the chance to fall in love with James Bond, and were able to have their own Goldfinger experience. Over the years, there have been six actors to this date who have played James Bond. Everyone seems to have their own favourite Bond, and which they think is the best Bond movie, and who they believe is the most beautiful Bond girl. 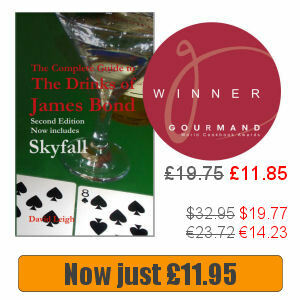 One thing Bond fans all seem to have in common is their love for the Aston Martin DB5. Well over 50 years later the Corgi Aston Martin DB5 has appeared in a total of seven James Bond films; Goldfinger (1964), Thunderball (1965), Goldeneye (1995), Tomorrow Never Dies (1997), Casino Royale (2006), Skyfall (2012) and SPECTRE (2015). This car remains the largest selling toy car Corgi ever produced, and it’s still going. Corgi is still selling remakes of its Aston Martin DB5 and demand is still high. 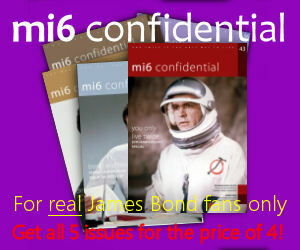 Without a doubt Corgi’s best known model, and a part of James Bond history. Thank you for having an article about the DB 5! #270 was the first of 10 DB 5’s; from 1/43 scale up to 1/8! But the most interesting background about the car, is written down by Dave Worrall in his book “The most famous car in the world”. Unfortunately ends the story with the theft of the only real DB 5, the DP/216/1. After the other four (?) cars used for promotion activities of Goldfinger, there were more cars made to these specifications. Should be interested to know where and when and owned by whom? The latest news is that Aston Martin itself offers a remake in 1:1 for only 25 issues!